I know I’ve shared plenty of granola here before, but I have a new favourite. 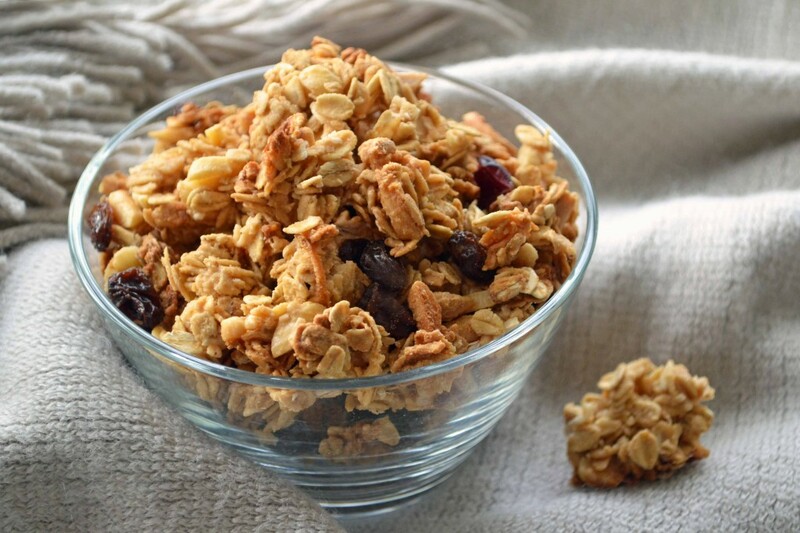 This clumpy, crunchy granola is bound together with peanut butter and pure maple syrup. I KNOW!! 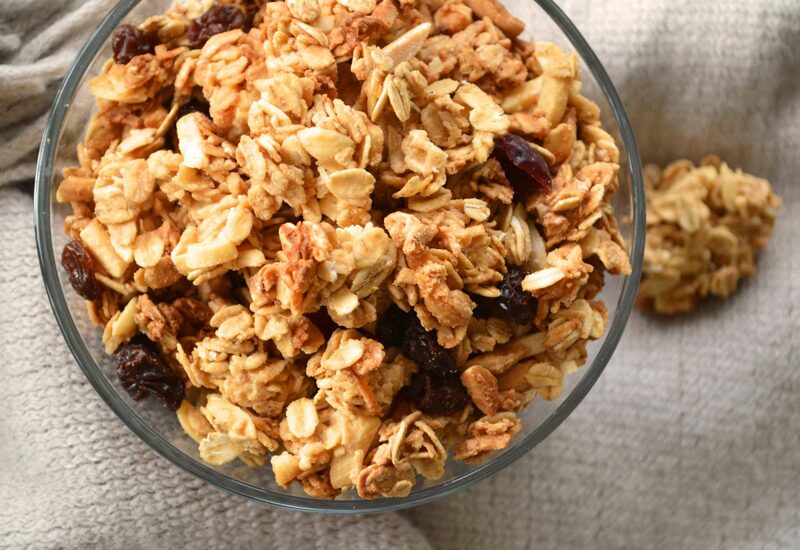 The peanut butter adds a light crunchiness I’ve never achieved with other granola formulas – like Harvest Crunch, without the over-the-top sweetness. Next time I’ll venture into peanut butter and honey territory. I’ve had a big baking sheet of this on my kitchen counter all afternoon, and when I had to leave the house I got all panicky for a minute that I had to leave my new bff, and wound up filling a ziplock bag of it to tuck in my pocket and sneak handfuls of. You could of course spice it up with cinnamon or a pinch of ground ginger, but I kind of like it straight-up. Of course feel free to take liberties with nuts, seeds and dried fruit, too. I’m a bit of a granola addict myself, so of course I’ll be trying this. How wild and crazy would it be to add some little dark chocolate chunks to the party? I’m hoping this would be fine with natural PB? Anxious to try it; yum!! Hmmm I think I know what I’ll be making for breakfast tomorrow! Just sailing home from Antarctica (seriously — it was amazing!) and craving whole grains like crazy — this is the first thing I’m going to make when I get home. Thanks! I love the sound of this. I love peanut butter granola but this version looks delicious. Would love to try it with some cocoa nibs! Looks delicious!! Excited to try this recipe and so grateful you shared it with us! Made this yesterday and can’t publicly admit how much I’ve eaten already. It may cure my obsession with the yogurt parfaits from Rise Bakery, which I buy mostly for the granola. This sounds amazing!! I can see why you loved it. I’ve been looking for new granola recipes and will definitely try this next. love this! I used 1/2 cup of honey (total) instead of adding brown sugar. It’s great. I also stirred in some rice krispies in the last 15 minutes of baking to give it a bt of lightness. Fantastic! Clumpy! Yes! I made a batch of Cherry, Coconut & Almond Granola to snack on while nursing my little one, but it ended up being impossible to eat one-handed. I need clumps. Peanut buttery clumps sound even better. I will have to give this one a whirl. I made 2 batches and it didn’t create the clusters you have in the photo. Should I double up on peanut butter and honey? I made this, using honey instead of maple syrup. (http://bit.ly/A6kB3i) I didn’t get the clusters either, but I suspect that’s because I used five cups of oats. Next time I’ll use only four. what is the trick to the clusters? got some but alot of it was vey individual, did I stir to much initially instead of tossing? would that be the make or break technique? Smells great tho! I made this today and it was incredible!! My teenage son, (who was bitter about the trip to the ‘smelly’ bulk food store), hasn’t stopped munching all afternoon! I added some cinnamon, some ginger and sunflower seeds. It’s delish!! I have to say, I’ve made quite a few recipes from your lovely site and all have been spectacular. The dark chocolate orange chip cookies were quite the hit at work and I’m planning on “Spilling the Beans'” being my next cookbook purchase. Thanks for the great meals!! I’ve made this twice already this week. Thanks for a great recipe! I made this, and it’s pretty good, but it didn’t turn out like how it was supposed to. I used natural peanut butter and it didn’t melt very well. Or maybe my problem was that I had the temp too high? Either way, I’ll be making it again, it’s definitely tasty! I made the recipe as called for except I didn’t add any dried fruits. I love Quaker’s Harvest Crunch and wanted it to be as similar as possible. It turned out perfect. A number of chunks but not all, tasted wonderful and lasted two weeks. The house smelled amazing while baking it, and the peanut butter hint was great, although it was a little too peanutty when eating it with just milk in the morning. I’m sure it would have been a pleasant hint of flavour if it was served with yogurt and berries but I didn’t try it that way. Thanks so much! Loved it. my 3rd time making this, loVE! I have been making this several times it is a very good recipe. Each time it came out phenomenal however I find it too sweet so I’m trying it this time without the brown sugar. I think it comes out too sweet because my shredded coconut is sweetened and the unsweetened coconut is a little pricey where I live. But otherwise worth making.